During his storied career as head coach of the Chicago Bulls and Los Angeles Lakers, Phil Jackson won more championships than any coach in the history of professional sports. Even more important, he succeeded in never wavering from coaching his way, from a place of deep values. Jackson was tagged as the “Zen master” half in jest by sportswriters, but the nickname speaks to an important truth: this is a coach who inspired, not goaded; who led by awakening and challenging the better angels of his players’ nature, not their egos, fear, or greed. This is the story of a preacher’s kid from North Dakota who grew up to be one of the most innovative leaders of our time. In his quest to reinvent himself, Jackson explored everything from humanistic psychology and Native American philosophy to Zen meditation. In the process, he developed a new approach to leadership based on freedom, authenticity, and selfless teamwork that turned the hypercompetitive world of professional sports on its head. 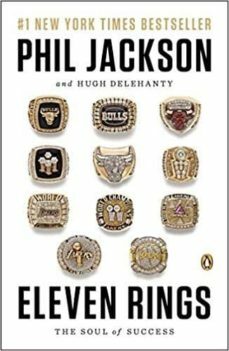 In Eleven Rings, Jackson candidly describes how he: • Learned the secrets of mindfulness and team chemistry while playing for the champion New York Knicks in the 1970s • Managed Michael Jordan, the greatest player in the world, and got him to embrace selflessness, even if it meant losing a scoring title • Forged successful teams out of players of varying abilities by getting them to trust one another and perform in sync • Inspired Dennis Rodman and other “uncoachable” personalities to devote themselves to something larger than themselves • Transformed Kobe Bryant from a rebellious teenager into a mature leader of a championship team. Eleven times, Jackson led his teams to the ultimate goal: the NBA championship—six times with the Chicago Bulls and five times with the Los Angeles Lakers. We all know the legendary stars on those teams, or think we do. What Eleven Rings shows us, however, is that when it comes to the most important lessons, we don’t know very much at all. This book is full of revelations: about fascinating personalities and their drive to win; about the wellsprings of motivation and competition at the highest levels; and about what it takes to bring out the best in ourselves and others.